The quality of your resume may significantly enhance your chances of landing the position of your dreams. 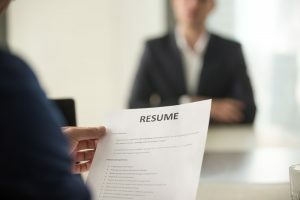 Too many highly skilled candidates have short-circuited their hopes of securing their position of choice because of a poorly constructed resume. Because the resume is the instrument for initial candidate evaluation, developing a professional resume is crucial to your success. The three key segments of a standard chronological resume are employment summary, work history, and education. The employment summary is a two- or three-sentence synopsis of one’s background experience and skill sets. It is designed to give the reader a quick overview of what the candidate brings to the table. The work history section is a chronological compilation of the candidate’s employment history by date, company, and position held. This section should begin with most recent job experience first and then proceed chronologically backward. Readers are looking for a short summary of specific functional and operational information, followed by a series of bulleted accomplishments. This portion is the most important part of the resume, as hiring managers want to know how your accomplishments could help them in the future. The education segment should include any college degrees, industry courses, and outside courses that have contributed to your career advancement. Additionally, you may wish to include awards and key references within or just below this segment. Another type of resume which many candidates utilize is the functional resume. This style focuses on the skill sets, capabilities, and accomplishments of the individual with little reference to company work history. This type of resume can be helpful in certain situations where duties and functional background are more important to the hiring manager. Our recommendation is to create two separate resumes—a standard chronological resume and a functional resume—so that you are prepared for any situation. Please note that it is not recommended to have an objective on your resume. Many candidates have been arbitrarily dismissed because their objective did not match a position they were qualified for and interested in. Devoting the time and care needed to produce a professional resume will have an enormous impact on whether or not you are hired or even considered for the position you’ve applied for. If your resume is in need of revision, we would be happy to supply examples of resume formats which have been highly acceptable to hiring managers. Our top priority is to make your hiring process as simple as it should be. With over 30 years of experience in the consulting industry, JL Nixon Consulting has compiled resources and services that will help you successfully navigate the process. Contact us by calling (210) 446-0163 to learn more.